A modern dental practice with extended opening hours on the Maliebaan in Utrecht. A modern dental practice with extended opening hours and high-quality dentistry. At Maliekwartier Tandartsen in Utrecht we prioritise our clients’ interests. We understand that a visit to the dentist doesn’t always fit into your busy schedule, which is why we are also open in the evening. Our dental practice is located on the Maliebaan in Utrecht. Register with Maliekwartier Tandartsen in Utrecht: first consult within 7 days. Our practice is open on Monday, Tuesday and Wednesday evening. Please call 0900-8602 for emergency assistance outside of regular opening hours. 0900-8602. Contact us for more information regarding our services for children or nervous dental patients. We are accepting new patients. Contact us on 030 760 1267 or fill in the registration form and we’ll arrange an initial consultation within 7 days. During this consult we will discuss your health concerns and wishes, assess your oral health, and prepare a treatment plan with your input if necessary. Our dentists have extensive experience with children and nervous patients. We know exactly how to reassure your child and take the time to address all of your questions and concerns. Contact us for a personal introduction and tour of the practice. Book your next appointment with Maliekwartier Tandartsen by calling us on 030 7601267 or sending an email to info@tandartsutrecht.nl. Would you like to reschedule or cancel an appointment? No charges are incurred if you let us know 24 hours in advance. Contact the emergency dentist outside of our standard opening hours via our emergency line on 0900-8602. After 11pm, the emergency line is only available for accidents and post-treatment bleeding. 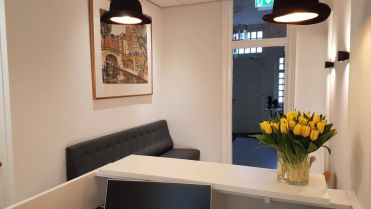 Our dental practice, launched in April 2017, is located on the Maliebaan in Utrecht. We aim to provide patients with the latest high-quality dental treatment and strive to ensure that all of Utrecht’s residents are given the opportunity to visit the dentist. Our large team allows us to offer extended opening hours. Our practice is open several evenings throughout the week to accommodate your busy schedule. MODERN PRACTICE IN A CHARMING HISTORICAL BUILDING WITH FRIENDLY AND PROFESSIONAL DENTISTS, GREAT TEAM.